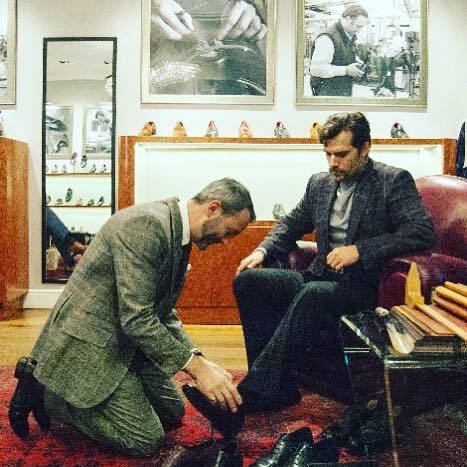 Luxury brand partner ZDLUX & Co. today shared this bts photo of Henry trying out his Tony Gaziano bespoke shoes in London. We're not sure if the photo is part of his recent shoot for The Rake magazine or if he's just preparing for all those Justice League appearances. Either way, nice look Superman! UPDATE 10/20: The shoes were for the shoot, and Tony Gaziano shared a few more photos from the fitting today. Ralph Lauren also took claim over that beautiful white tux. You know more promo surprises await! Some classy shoes, for the classy gentleman! *smiles* D.
So great to see a man in beautiful clothes and shoes! Seeing these clothes on an extraordinary looking man is icing on the cake. I have a problem with how casually people dress all the time, i.e. t-shirts, baggy pants, flip flops, etc.